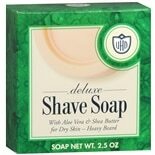 Shop Van Der Hagen Deluxe Shave Soap (2.5 oz. )2.5 oz. $229$2 and 29 cents$0.92 / oz. 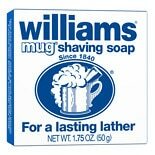 Shop Williams Mug Shaving Soap (1.75 oz. )1.75 oz. $149$1 and 49 cents$0.85 / oz. 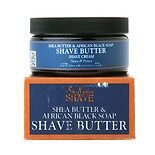 Shop SheaMoisture Shave African Black Soap Shave Creme (6 oz. )6 oz. $1049$10 and 49 cents$1.75 / oz. Lather up for a picture perfect trim with shaving soap. Without proper shaving cream, you could easily nick your skin or cause irritation and razor burn. Fortunately, there are a myriad of shaving foam products that keep your skin protected against the sharp blade of your razor. From classics like Barbasol and Gillette to newer product lines including Every Man Jack and Headblade, these lubricating gels and creams make shaving simple. Shaving razors are available in a wide assortment of different sizes and styles. Arguably one of the most difficult decisions related to men's razors, choosing the blade best suited to your needs isn't always straightforward. While some men prefer disposable blades that you can toss after one use, others choose sophisticated cartridges equipped with multiple blades and extra features. No matter which product is most appealing to you, choosing a trusted brand should help ensure you get a smooth shave without cutting yourself.